The Vine Neighborhood is the oldest and most central of the neighborhoods in Kalamazoo. It is south of downtown, east of Western Michigan University and west of Bronson Methodist Hospital. Vine neighborhood is known for many things; the college student population, the restaurants, the historic houses, as well as a vibrant community full of artists. In total, Vine is approximately 1 square mile in size. Vine Neighborhood has a population of approximately 5,572 (Esri Business Analyst, 2017) with a median age of 25 (Esri Business Analyst, 2017), and is one of the most dense neighborhoods in the City. Vine’s historic housing is one of its most defining features. 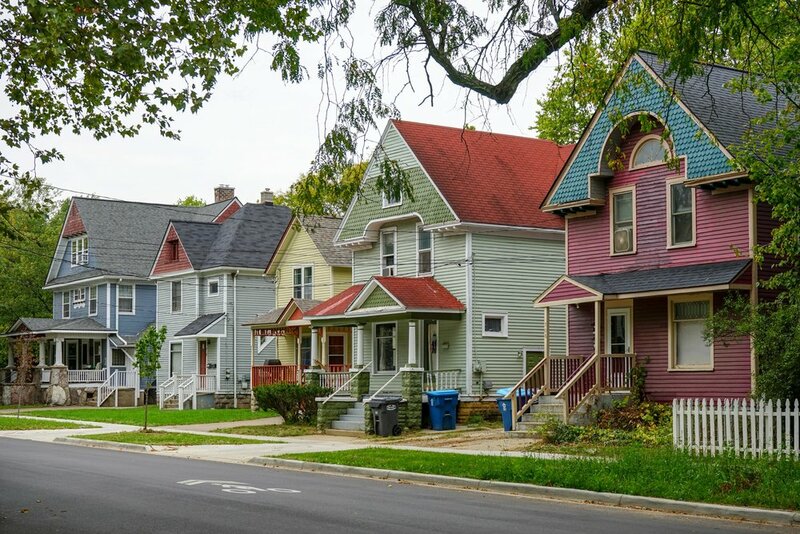 Being one of Kalamazoo’s first neighborhoods, houses in Vine date back to as early as 1838, with most of the housing stock being from around 1890-1935. Approximately 1000 buildings in Vine are located within a historic district. The businesses in Vine add to the eclectic nature of the neighborhood, with a large number of those businesses being small and locally owned. The businesses in Vine give residents access to many daily conveniences with local coffee shops, restaurants, hair salons, a laundromat, as well as opportunities for entertainment including a bike shop, record store, vintage clothing store, and bars, to name a few. Vine is a vibrant community with artists talented in many medias. With its close proximity to Western Michigan University and Kalamazoo College, Vine has historically had a large student population. The students add to the culture and youthful vibe of the neighborhood with infamous house music shows in basements. In recent years Vine has seen more young families moving into the neighborhood. Davis Street Park has brand new playground equipment, benches, picnic tables, bike racks, as well as a grill, picnic shelter, accessible concrete paths, and Skate Plaza. Dutton Park is handicap accessible and has a playground, benches, and open grassy areas with flowers lining the entrance. Crosstown Parkway Ponds offer grassy, wooded areas along with ponds where geese and ducks frequently visit. Axtell Creek Park has a playground, picnic tables, grills, and a non-motorized trail way. South Westnedge Park is a grassy wooded area with benches and brick lined pathways.